Learn why SAP ERP HCM Employee Administration is the key component in SAP ERP HCM, and why it is built around the Personnel Administration (PA) component. Explore the various types of data that can be stored in Employee Administration, such as HCM Infotypes and pay structures, and learn how to set up your company structure, including enterprise, personnel and functional organizational structures. Companies need to know how to keep up with constantly-changing employee information and records. But how can companies meet the challenges of storing and accessing sensitive employee data on a regional and global scale? Where can organizations store employee data as it changes over time? In this chapter, learn how to use SAP ERP HCM Employee Administration, and how it can be integrated with other components of SAP ERP HCM. SAP ERP HCM Employee Administration, the key component in SAP ERP HCM, is built around the Personnel Administration (PA) component. In this section, learn about the types of data that can be stored in Employee Administration, such as HCM Infotypes and pay structures, and learn how to set up the three company structures needed to map your company into Employee Administration. In today's rapidly globalizing marketplace, companies around the world grow, expand, acquire, and merge at a rapid pace. As a result, companies are faced with maintaining unprecedented volumes of employee data. The challenges and complications of storing and accessing sensitive employee data globally, while also making it accessible and tailoring it to local and regional demands, presents major issues for companies. The SAP ERP HCM Employee Administration functionality is designed to face these demands and has three key purposes. First, it acts as a centralized database for all of your employee master data, enabling system users, management, and employees to access up-to-date, consistent and relevant information to support decision making. Second, it's the part of SAP ERP HCM where you define your company structure, and create a framework that meets your processing and reporting requirements while working well for your employees. Third, it's designed to enable your company to automate and streamline most of your day-to-day HR processes, saving you time and money and allowing your HR department to focus on strategic rather than administrative activities. This excerpt from Discover SAP ERP HCM by Greg Newman is reprinted here with permission from SAP Press; Copyright 2008. Because Employee Administration is the core function of SAP ERP HCM, it's the bedrock that all of your other SAP ERP HCM components are built upon. It is critical that you understand the Employee Administration functions and keep in mind their possible impact on other SAP ERP HCM components when designing and implementing the system. This chapter will give you an understanding of how Employee Administration is used, how it's structured, and how it integrates with other SAP ERP HCM components, along with some of the key concepts behind Employee Administration in general. Because it is the central database for storing employee data, the Employee Administration function is the key component in SAP ERP HCM. When companies use SAP ERP HCM, this function is the most frequently accessed part of the solution. All other employee-related HCM processes, such as recruiting, performance management, and payroll, reference and make decisions based on the data stored in this function, so employee administration sits at the heart of your company. The Employee Administration function is built around the Personnel Administration (PA) component, which is where all of your employees' data is stored. A large amount of the information input into other SAP ERP HCM components ends up stored in PA and can be accessed from Employee Administration. This means that in addition to your core employee data, you can view data from many of the other SAP ERP HCM components from inside the Personnel Administration component. What information can you store in Employee Administration? How does SAP ERP HCM refer to this information? How is employee data stored? As befitting an SAP ERP HCM system that is used by over 10,000 companies around the world, you can store almost any data in Employee Administration. The data is stored in various forms, beginning with employee data, which is stored in records called infotypes. Each employee record has multiple infotypes: one that contains details of his current organizational assignment, one that details his basic pay, one for bank details, and one for his address. Employee Administration's main purpose is to store infotypes that record the history of a person's employment with your company. Every employee has many infotypes stored for his employee number, so in Employee Administration, among other things, you can quickly view all of the positions that an employee has held in your company and all of the changes to salary over his employment history. Having your employee data stored in infotypes gives you a logical, controlled, and secure structure that ensures your administrators can access and maintain the data in a way that makes Employee Administration efficient and streamlined. SAP ERP HCM delivers over 650 standard infotypes catering to all of your employee data storage requirements, ranging from recording your employees' civil awards and decorations (Infotype 0861) to the finer details of their garnishment orders (Infotype 0195). 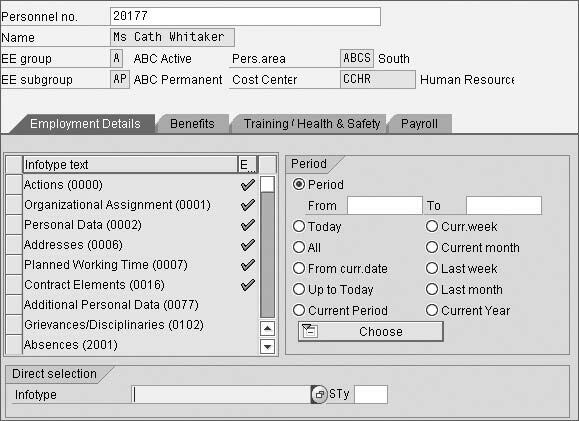 We'll talk more about infotypes and the other objects used to store employee and organizational data in the following sections, but you'll also need to configure your company structure in Employee Administration so that you can map out where your employees physically and legally work. So first, let's look at the structures that SAP ERP HCM uses to define the legal and physical structure of your company. How Is Your Company Defined in Employee Administration? The enterprise structure is the method used for defining how your organization is set up in SAP ERP HCM. Aligning your company correctly to this structure is one of the most important steps of an SAP implementation, because the enterprise structure defined here can have important ramifications on later decisions, not just in Employee Administration but in many other SAP ERP HCM components as well. 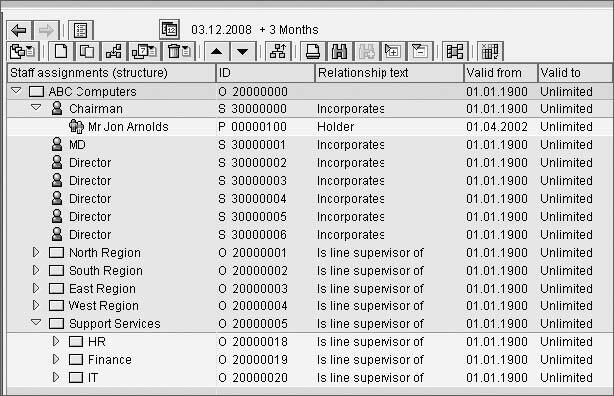 The SAP objects that combine to make up the enterprise structure are shown in Table 2.1. As opposed to the enterprise structure, which defines the organization from a legal and physical point of view, the personnel structure defines the organization from the employees' point of view. Because the personnel structure is used to separate and group all of your different types of employees, it's frequently used as a decision point in payroll processing, time management, and shift planning, so it's vital that these groupings cater to all of the separate categories of employees within your company. The personnel structure in SAP ERP HCM is defined by the objects in Table 2.2. The third of the key structures used in Employee Administration is the organizational structure. This will be covered in more detail in Chapter 10, but in brief, the organizational structure represents the functional structure of employees in the organization. It defines the organizational hierarchy, the reporting and authority lines, and organizational groupings. The organizational structure is defined by the personnel development (PD) objects as shown in Table 2.3. Figure 2.1 shows an example organizational structure with organizational units, positions, and one employee. These are ERP-specific terms for the different structures used to store employee data. Infotype records are valid for a specific period of time, so, for example, as an employees' salary is changed during his employment, the employee will build up a chain of date-based infotype records showing a history of his salary changes. Each infotype is defined by a four-digit key, and where subsets of the infotype data are required, the infotypes have subtypes. These subtypes are also defined by a four-digit key. Let's explore these in a little more depth. Personnel Administration infotypes can be maintained via the Maintain Master Data transaction. Figure 2.2 shows a transaction with an example employee and some of the infotypes maintained with it. These are used by many countries, and it's worth noting that within this set, SAP allows country-specifi c views of international infotypes to provide more flexibility. Where required, SAP has also provided country-specific infotypes to meet country-specific requirements. These are the most widely used infotypes and are used for storing information that is required by most companies regardless of the employees' country. Some examples of the most commonly used international infotypes and infotype subtypes are listed in Table 2.4. Figure 2.3 shows Infotype 0006 Address subtype 0001 Permanent Address. 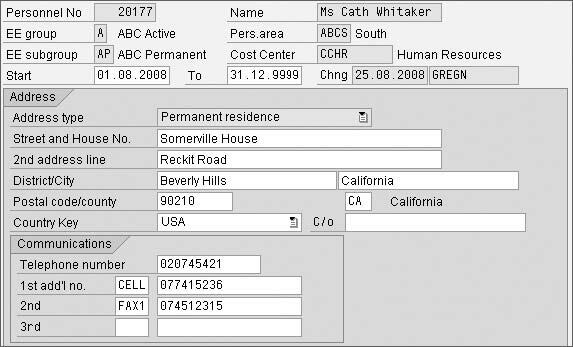 SAP has succeeded in making infotypes very flexible in that an international infotype can have different fields available for input depending on the country of the employee whose data it holds. So, the fields contained in the infotype change depending on the country's statutory or organizational requirements. In Infotype 0002 Personal Data, the country-based information is displayed depending on the employee's location. You can see specific country fields in Table 2.5. 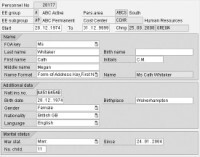 Figure 2.4 shows Infotype 0002 Personal Data for Great Britain. Many companies require information to be recorded that is only relevant to employees in one country. SAP ERP HCM accommodates this through the use of country-specific infotypes. These infotypes are only visible and available to the employees in that country and are designed to meet the specific needs of the country. Some examples of country-specific infotypes are shown in Table 2.6. Country-specific infotype subtypes are also delivered for international infotypes when a new infotype is not required, but country-specific data is required for the infotype (Table 2.7). 0006 Address US01 Paycheck Location U.S.A.
Now you have an overview of the employee-focused Personnel Administration infotypes. Next, let's look at the more generic Personnel Development infotypes. Personnel Development infotypes are very different from Personnel Administration infotypes and are used for very different tasks in Personnel Development and Organizational Management. Their use will be covered in more detail in the respective chapters on these topics. Figure 2.5 shows the most common infotype in Personnel Development, Infotype 1000: Object. Another key element in Employee Administration is the concept of a wage type. You can download a pdf of this chapter. You can also visit SAP Press to purchase a copy of Discover SAP ERP HCM.